Taking its inspiration from the Great North Run – the world’s biggest half marathon – the Great Swim series is the UK’s largest mass participation open water swim, and this summer’s series is set to be the best yet. The series comprises five events – the Great North Swim, the Great East Swim, the Great Manchester Swim, the Great Scottish Swim and the Great Newham London Swim – and will see around 20,000 swimmers take part. The swims are held in quays, lochs, lakes and docks and although they’re not strictly charity events, many participants will receive sponsorship, raising funds for some terrific causes. The Great North Swim is Europe’s biggest single open water swimming event. Some 10,000 participants will take part in this year’s event alone, which takes place over three days between 10-12 June, set in the beautiful surroundings at Lake Windermere in the Lake District. The event is suitable for swimmers of all abilities, and has first class safety measures in place with swimmers monitored at all times. A variety of races across a range of distances will take place over the three days, with big screens and excellent facilities for spectators, participants and their friends and families. Taking place on Saturday 18th June – in the beautiful Alton Water reservoir in the Suffolk countryside – the Great East Swim is a really great day out. As well as the swimming, a host of other cultural attractions will be on site, including a farmers market showcasing loads of fine local produce to enjoy. Swimmers of all abilities can get involved, while this year’s elite race will be a part of the European Championships selection criteria. The Great Manchester Swim course at the impressive Salford Quays runs from just near the BBC’s Media City HQ and finishes around a mile away near the Helly Hansen Watersports Centre. The Quays offers excellent spectator access along the waterside, and in 2015 100% of participants rated the event as good or excellent. This year’s renewal will be staged on Saturday 2nd July. Who wouldn’t want to swim in the shadow of Canary Wharf and the O2 Arena at the Great Newham London Swim?! Safety kayakers will accompany your every stroke as you negotiate one of the capital’s biggest urban swims. The event, on Saturday 16th July, has races at three distances – ½ mile, 1 mile and 2 miles – and after your swim the world’s greatest city, and everything it has to offer, will be your oyster. In keeping with Great Swim’s predilection for hosting events in spectacular surroundings, the Great Scottish Swim is set to be staged at Loch Lomond on 26-27 August. Surrounded by stunning scenery, Loch Lomond is arguably the dream venue for an open water swim. A host of distances are available, from ½ a mile up to the brand new 10km swim. It’s not too late to kit yourself out in some Kudos custom swimming kit, book a weekend away in one of these fabulous regions and combine a weekend break with an invigorating open water swim. Good luck! 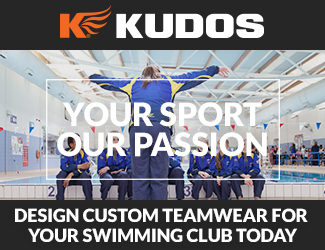 KUDOS is passionate about encouraging people from all backgrounds to get into swimming at any level.